I wanted to spend more time up there but we have another plan in the afternoon so we need to go back to our hotel and get ready. Initially, i plan to with the day trip cruise but since its my partner birthday 3rd july, so we plan to stay 1 night on the cruise and let her enjoy her moment. haha. Istarted searching for a nice cruise with affordable price for the cruise. Normally the best cruise is where you pay more. I book the cruise through Agoda.com with RM263/p not including transportation Hanoi-Halong. 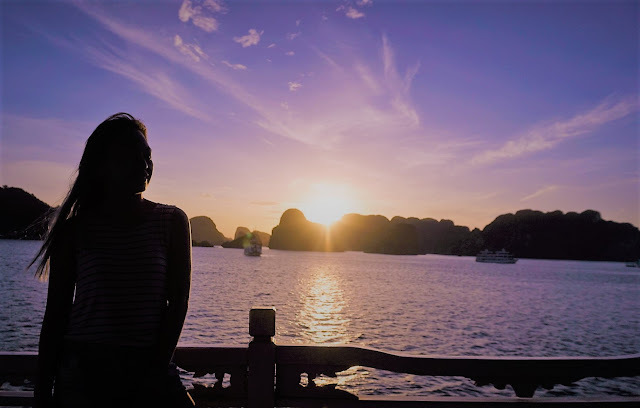 Usually the price can be around rm350/p but that's including transport form Hanoi to Halong. If you want a transport. you will need to add another USD 20(2 way). 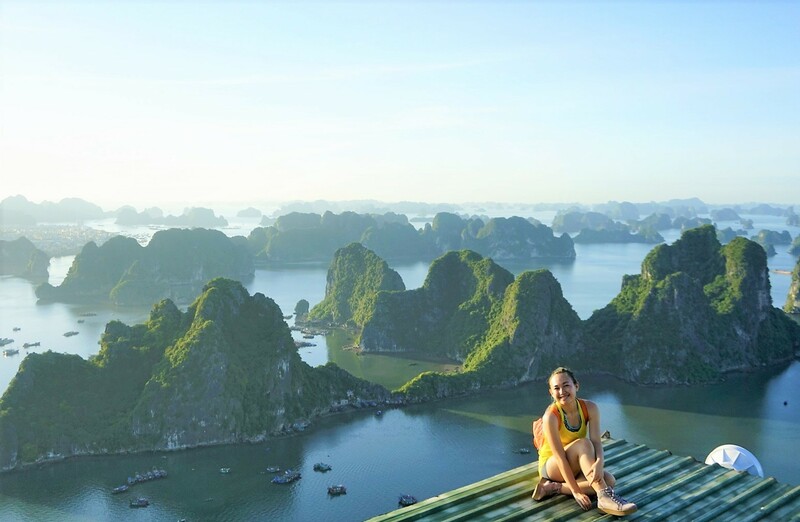 Since we want to go hiking first in the morning we decided to go ourselves to Halong the day before. And of course the price is cheaper if you go with public bus. So, from our hotel we still need to pay rm20-5usd to go to the Halong Gate via taxi. Our kind guide Mr.Thang greeted us and united us with other cruise-mate from all around the world. waisey. And here we met another Malaysian from Melaka which is very fortunate! The cruise is well maintained. The toilet+shower is clean but the bed is hard (The truth is i seldom found soft bed in Vietnam's hotel). But there's some of our cruise-mate complained about the room being so hot. The air-conditioner will only turn on at 7pm to save energy so, yes it's quite hot but we spend most of our time on the roof top so honestly i have no compaline about this cruise. the food is also nice. Not super-nice but nice for me. most of the food is asian food so our table-mate who came from Mexico didn't really like the food. probably because its too asia for them. i don't know. But i am okay with the food. i don't eat pork so i requested for no pork food which is very convenience for our Muslim friends. the activity on the cruise is something like this. We decided to skip the hiking since we already went hiking that morning and decided to relax on the cruise instead. But we went for the Kayaking and swimming. it was really fun but i think the time is limited so macam tidak puas mandi manda. lol. The squid fishing is not really interested to me. quite boring. The next moening we woke up very early actually to catch the sunrise. I just love the morning breeze in Halong Bay. so, refreshing. not so cold and not so hot. And then we went back to our room which i regret it because i miss the taichi! i woke up again at 6.30 but they are finish already. huhu..so sad. After breakfast we went to visit the Sung Sot Cave and then we had lunch and we head back to the departure gate. We decided to go with the tourist bus to Hanoi. We arrived at Old Quarters,Hanoi around 4pm and went to buy the ticket as soon as possible. I think we are very lucy because i have a friend who used to work as a tourist manager in Hanoi. she actually offer us cheaper bus ticket RM92 to Laos compare to other place rm120. The 22 hour sleeping bus. this is our 22 hours sleeping bus. 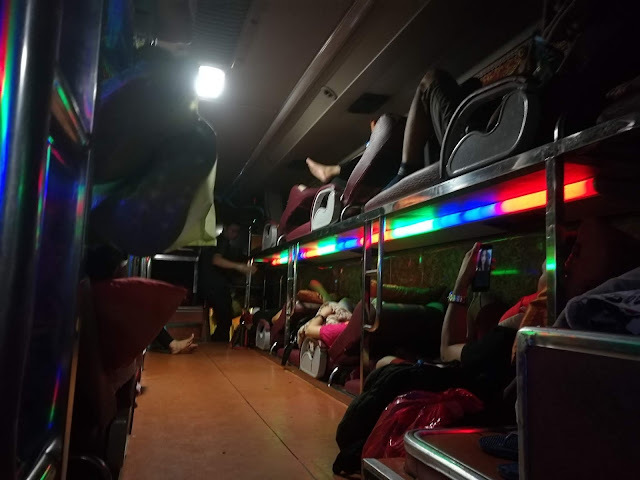 I've read it through the internet that Hanoi-Laos sleeping bus is a nightmare. But i thought it was just a one time bad luck until i experience it myself. There's this thing with every Vietnam bus, the local always come first. The same thing happened to us. When we enter the bus, there are still plenty of pleasant seat in the front row but the conductor scold us when we tried to seat there and told us to go to the back lower seat which has no window. Huhu. And then i just realize that all the Non-Local placed at the back. I didn't really care about the seat has no window because we are going to sleep all night long anyway but what makes it worst is that, the air conditioner is not functioning well. Like everyone on the bus are self-fanning themselves and its a 22 hours bus for God sake! I keep waking up in the middle of the night because i was sweaty and smelly? lol. 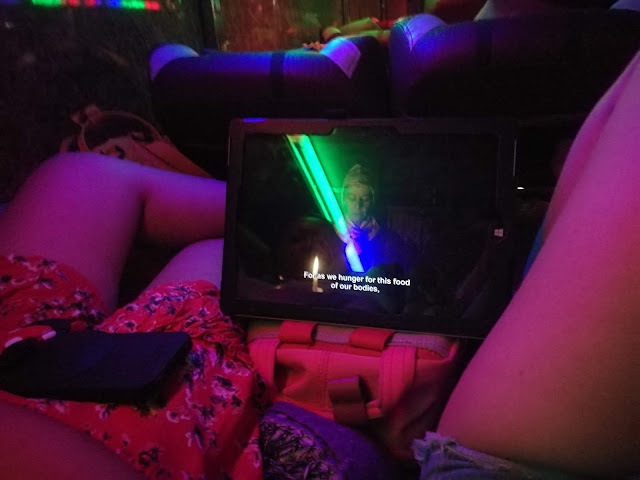 watching Movies in the bus is our favourite. When i woke up at 3 am, the bus is not moving. And there's a lot of other people are sleeping on the floor of the bus. Turn out that we have arrived at the Vietnam-Laos Border but it was only open at 7 am so we need to wait until 7. And my guess is that the people sleeping on the floor is probably the driver and the conductors. Me and my buddy both woke up again at 6 am and went to clean ourselves in the toilet. It was raining and i really don't want to get into the bus again because it was so hot in there so we decided to wait at the immigration office until 7. 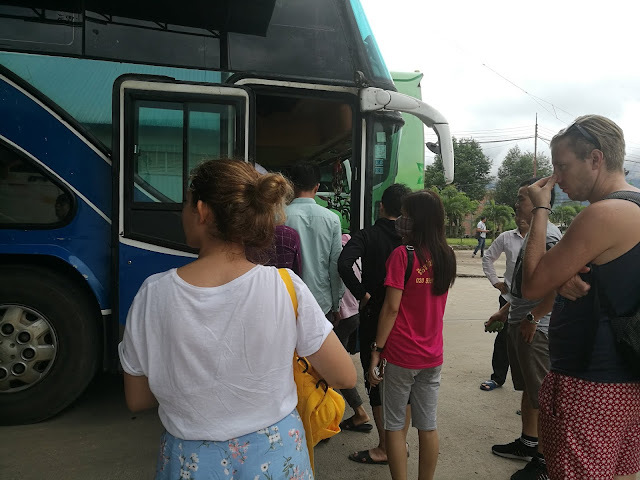 After we passed the Vietnam Immigration, we ran to our bus only to know that we still need to go through the Laos Security to enter LAOS. So, we went out the bus again and guess what.. there's a sea of people (mostly local) were already waiting there. We stood by the side od the sea of people feeling hopeless because we know we can't never go through that in an hour or two. Lucky us, earlier while we are lining up for the Vietnam immigration officer we met this uncle from China. He was lining up behind us and had a chit chat with Stacy (I can't speak Chinese and the uncle can't speak english so i just stood there smiling. hohoho. i should study mandarin!). He was travelling alone too. So,while waiting for that ton of people to reduce its number, the uncle gave us hope. He ask us to follow him closely from behind and go through the sea of people to the LAOS security officer. Turn out that half of the many-many people can't go through the immigration security yet because their passport is not with them (remember their conductor took all their passport to cop at the immigration officer?). They were just there to mark their place. My gosh. We were really thankful to the Chinese uncle because if its not for him we might stood there for an hour or two. huhu. After going through the Laos security we finally headed to the LAOS immigration office where we need to walk for 15 minutes and cross the bridge. Malaysian are lucky, we don't need visa to enter Vietnam or Laos so the process is quite simple but most of the non-local with us that day need to apply visa first to get through the immigration. Unlike Vietnam immigration officer, Laos Imiggration officer didn't allowed local to go first. when i was in the line, one of the conductor try to cut me but the Laos Officer told them to get in line. YEYYYYY! i finally found some justice! lol. Just kidding. Hurmm.. what else ahh.. Ohh the currency exchange! Laos only accept Vietnam Dong,Thailand Baht and US dollar. All the other currency are not accepted including Malaysian Ringgit. And i couldn't find a shop that accept Laos Kip in Kota Kinabalu, so make sure to change your money to Vietnam Dong or Thailand Baht before entering Laos. Or you can change it in dollar to make you life easy. The bus only departed from the Laos border around 10am to Vientiane. So it wasn't actually a 22 hour sleeping bus. Hanoi to the Vietnam border is only 8 hours and from the border to Vientiane is around 6 hours. so it was actually only 14 hours approximately but since we need to almost 4 hours for the immigration to open and then wait for all the passenger to pass the immigration took almost 3 hours, so yes it was a 20 plus hours la juga. We arrived in Vientiane around 3PM local time and there are still a lot to tell. But I'll post about our journey Laos in my next post so stay tune. Show some love by watching my Vlog about the trip. hope you enjoy the video and subscribe! thank u.